What an amazing place to spend a week! The location is perfect on the beach and the pool is a very nice extra. But the people and the donkeys there really made for a fantastic relaxing atmosphere. All the food but especially the daily specials are delicious. Thanks for everything:) Perfect place for a holiday within our travels! The best hostel I stayed during my 6 months travel in Latin America. I had the bad experience of breaking a leg while surfing. The staff was so nice to me and helped me in every possible way so that I could plan everything for my way back. 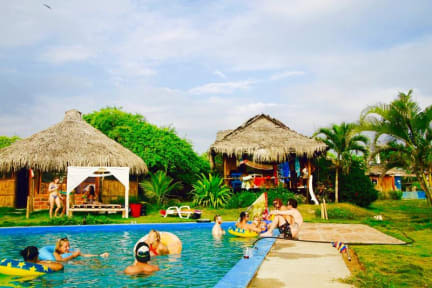 The atmosphere in the hostel is simply amazing, very nice place to meet a lot of people but also find some peace being a couple of minutes away from the chaotic downtown of Montanita. Thanks to everybody! I’ve had a great time at Kamala! It is a great place to meet people, the food is good, the staff is lovely and it’s actually quite nice that it the hostel is located a bit outside town so you are not bothered by the loud music when you want to sleep. Highly recommend this place! Had the most amazing time at Kamala's! Very nice atmosphere and location. Moreover, the staff was very friendly and the food is really good! I booked only one night but ended up staying a week (didn't want to leave at all actually). Had the best time here. Really nice staff and good vibe. Great place to meet other people. I highly recommend this hostel! Really enjoyed my stay here. The staff and volunteers are awesome. Very relaxing and social atmosphere. Can turn into a party at night but will naturally move to the town so it doesn't bother you too much if u ur not feeling like it and is of course alot of fun if you are. The food may seem a bit pricey at first but wait til you see the portions and taste it! Also the cocktails are really good. Cozy hostel with great, laid back atmosphere!Lots of other backpackers to hang out with/play ping-pong, pool etc. Unfortunately no sun when we were in Montanita so a lot of playing those games. The hostel is within walking distance from the town, and it's a good thing not to be in the middle of all of the loud music in Montanita. Anna helped us organise a whale watching tour, which was awesome. It was end of season, but we still saw some whales really close to the boat. We really enjoyed Kamala! Really enjoyed my stay at Kamala! The dorms are basic but good value considering their price. There is a nice pool and many hammocks and lounge beds to hangout. Very delicious food and a well stocked bar. It’s an easy place to meet new people through the family style dinners and bar nights. Ana was insanely kind and super helpful with any questions or problems. Perfect place to enjoy the sun and beach by day and party with fellow travelers by night!